When you select the module from your modules page, you'll see a page much like the screenshot to the right. 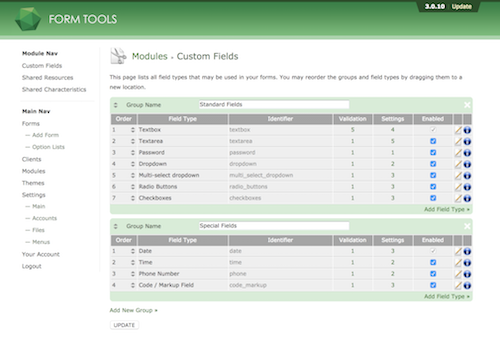 This page lists all field types in the database. Let's look at each different element in the page individually: there's a lot here! The first thing you'll notice is that the field types are arranged into two groups: Standard Fields and Special Fields. This grouping affects how the field types are listed in the Edit Form -> Fields tab, whenever you select the field type for a form field. Using this module, you can change the group names and order to whatever you want. Like much of Form Tools, the field types and groups on this page can be sorted. To change the sort order of a field type, just click the first "Order" column and drag the row up or down. To move it to a different group, just drag it over! To re-sort the groups, click and drag the group via the icon at the top right of the group. Order As mentioned above, you can click on this row to re-order the field types. Field Type The name of the field type. Identifier This is used programmatically to uniquely identify the field types. Identifiers must be unique. Validation This lists the number of validation rules defined for this field type. These appear as options in the third "Validation" tab of the Edit Field dialog. Settings This lists the number of settings available for the field. These appear as options in the second "Settings" tab of the Edit Field dialog. Enabled This setting lets you disable certain field types so they don't appear as options within Form Tools. Note: if you try to disable a field type that's already in use, it will notify you when you save the page that it will change all fields using that field to a textbox. The textbox and date fields cannot be disabled. "Edit" icon As with most Form Tools tables, click this icon to edit the field. Some fields (those with an "info" icon on the next column) can't actually be edited, but you can still click around the pages to see how the field is configured. "Delete" icon The final column lets you delete an entire field type. You'll notice that some columns forbid you from deleting them and just show an "info" icon. That icon appears for the "Textbox" and "Date" field types, and for any external field type module (Google Maps, file upload, tinyMCE etc). External field type modules may only be deleted by uninstalling the module. The Textbox and Date field types cannot be deleted because the Core fields (submission ID, submission Date etc) require them. To add groups and types, just click on the appropriate link on the page. The "Add Field Type »" links are found at the bottom-right of all groups. When you click that, a dialog window appears that lets you create a new field type from scratch - or based on an existing one.